← Are Russian writers truly the greatest? One of my more popular posts recently was the one about authors’ blog tours. After reading it, James Tenedero, a Canadian author, asked me if I’d be prepared to host him when he organized his blog tour today. James is from Montreal, but has traveled extensively in Europe, as you’ll find out when you read his book, The Consistency of Parchment, a thriller. You can find out more about his background at the bottom of this post. Since this is James’ first novel, I wanted to know how, exactly, he arrived at a finished, published work. I was interested in the process from first concept through editing to self-publishing. I think you will be ,too. GC: I can see from the book that you’ve traveled in Europe a great deal. Did you live there once? And, – a couple more questions: What gave you the idea for this novel, and why all the train trips? JT: I have studied in Copenhagen, and I also lived in Budapest for a short time. The idea for the novel really originated during my stay in Hungary. At the time, in 2003, the transition from Communist rule to democracy was already well underway, but I was still struck by the lack of severe Soviet-era architecture and customs; while there were traces of this past, much of that history seemed to have been swept out of view. I started to consider the idea that we relate to the past in a very visceral way through the symbols and artifacts that we encounter in our daily lives. This is really the key underlying theme of the book, from which I then developed the storyline involving Cal, Kendra, and their journey to discover the contents of the safe deposit box for which Kendra possesses the key. The frequent train trips in the book were based on my own travels throughout Europe. I used these episodes as a way to develop the bond between Cal and Kendra, and to flesh out the details of their motivations without impeding the narrative arc or the pace of the story. GC: Once you had your ‘final’ draft, who edited it? JT: I edited the book myself. Although I don’t have the skill set of a professional editor, I did work as a proofreader for a federal government agency for several years – so I have some sense of what to look for. Ultimately, I decided that the person best able to tell the story was me. So it seemed to make sense for me to write and edit the book myself. I’m a big proponent of the desk-drawer approach to editing: finish the draft of your manuscript, set it aside for a few weeks, and then come back to it with a set of fresh eyes. GC: When you decided to publish, where did you start? I assume you had a Word document, but what happened next? JT: Since I had made a decision to publish with Amazon’s Kindle Direct Publishing, I followed the template provided in their Building Your Book for Kindle guide, which is available online for free download here. I formatted the manuscript accordingly, added hyperlinks for the Table of Contents so that readers could easily navigate through the book on their Kindle, and then uploaded the full document for sale on the Amazon website. GC: Who designed the cover and layout? JT: As with the editing, I selected the cover art and designed the front cover. (You can probably tell that I like to exercise a good deal of control over the way that my writing is presented, and with The Consistency of Parchment I was an unabashed monopolist from conception of the story to sale of the book!). The photograph is taken from a cemetery in Manchester, England, which I visited earlier this year, and I experimented with several different fonts before settling on the text that you see here. I’m happy with the overall result, and I’ve already had some very complimentary feedback in this vein from potential readers! GC: Where is it available? JT:Although there are certainly many options for authors looking to make their books available on the Web, I chose Amazon because of the popularity of the site. I wanted to ensure that I had the largest possible audience for my work, and Amazon provides me with this opportunity. Another nice feature of their publishing model is that you’re essentially unrestricted in terms of the potential volume of sales you can realize. You publish online, your book is automatically listed by Amazon, and your ultimate success is dependent on the quality of the product (as determined by the readers and reviewers, not by literary agents or publishing houses) and the amount of effort you devote to marketing it. GC: When you sent me a review copy (thank you) it was in MOBI format. Can you tell us why you chose that format? JT: I chose MOBI as my format because of its simplicity and inexpensiveness. An author can use freely available software such as Mobipocket Creator to convert a manuscript into MOBI. Also, these files are fully compatible with the Kindle, which of course was an important consideration for me! GC: I opened my copy using Calibre, and then transferred it to my Kindle Fire. Am I right in thinking that this only works for free copies? JT: Although I haven’t used Calibre myself, my understanding of the tool is that it works for both free and paid copies. GC: So if people want to buy it, how much does it cost, and where can they find it? 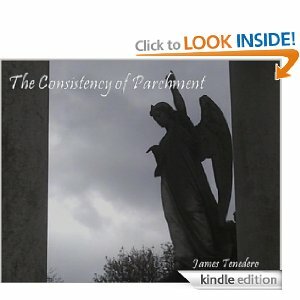 JT: The Consistency of Parchment is currently on sale for $2.99 on the Amazon web site. Since my book is included in the Kindle Owners’ Lending Library, Amazon Prime members can obtain it for free. Also, the familiar ‘Look Inside’ feature allows readers to sample the first couple of chapters before deciding whether to purchase the book. Thank you for hosting me and allowing me to speak about my work! 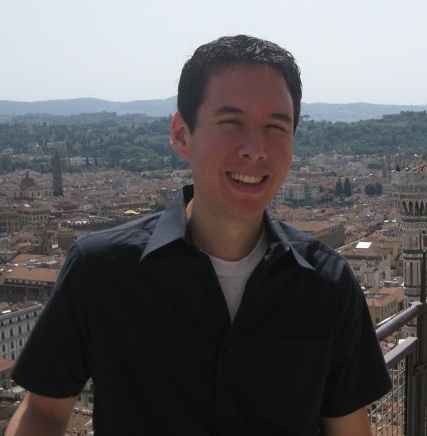 I would invite your readers to follow me on Twitter (@jamestenedero), connect with me on Goodreads, and Like my Facebook author page. I’m always interested in hearing from other authors and readers, so feel free to get in touch with me through any of these channels. I hope you enjoy the book, and I welcome your feedback and comments. That was another excellent post today. Thanks so much for sharing. Keep up the fantastic job.